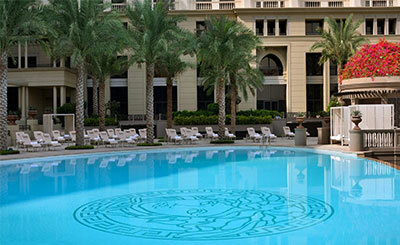 Palazzo Versace Dubai is situated in the heart of the Culture Village , less than 15 minutes away from Dubai International Airport and 8 minutes away from Burj Khalifa and Downtown Dubai, Palazzo Versace Dubai is conveniently located along the shores of the historic Dubai Creek. 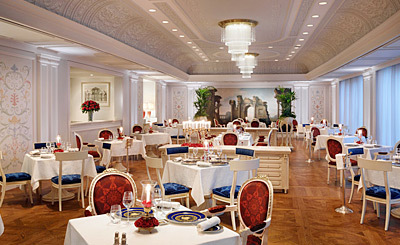 Giardino : Indulge in a luxurious choice of international cuisine with live station station. 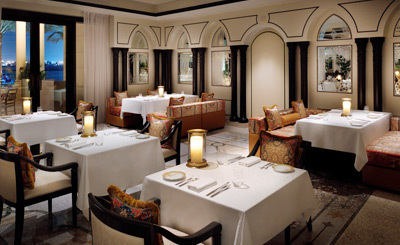 Vanitas : Signature italian restaurant. Mosaico :Mosaico restaurant resides in an opulent setting at the very heart of the hotel and is a personal reflection of Gianni Versace's ornate compositions. Q's Bar & Lounge : Ultra chic venue with live entertainment. La Vita : Lifestyle Bar. Amalfi : West Pool outdoor restaurant. Spacious, bright and elegant, these richly-appointed 50 sqm rooms combine fine Italian workmanship with everyday functionality. Taking luxury and comfort to another level is the linen and upholstery that feature exclusive patterns and decor fashioned by Versace. Guests can enjoy the unparalled level of bespoke services of the Executive Lounge at an additional charge and can choose from views of the Dubai Culture Village. Occupying the higher floors of the hotel and measuring 52 sqm, these rooms combine fine Italian workmanship with everyday functionality. 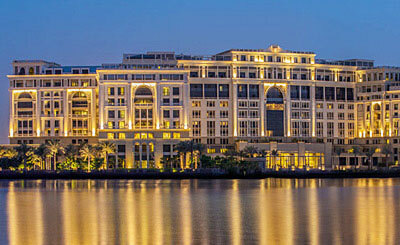 Guests can enjoy beautiful views of the iconic Dubai Creek from their balcony or terrace, or choose to relax on their king size beds with linen and upholstery that feature exclusive patterns fashioned by Versace. The unparalled level of bespoke services of the Executive Lounge can also be enjoyed at an additional charge. Designed for the modern day luxury business traveller, these 95 sqm suites are both elegant and comfortable. Overlooking the Culture Village and enjoying plenty of natural light, these suites offer privacy and intimacy with a spacious living and dining area behind which lies a bespoke king size bed. A walk-in wardrobe, freestanding mosaic tiled bathtub and Hollywood-style vanity table make up the uniquely designed dressing area. An exclusive feature of the Junior Suite is the separate study area which features a well-equipped work area, ensuring you maintain the perfect balance between work and leisure. Cosy and spacious, with stunning views of the Dubai Creek, these suites have an individuality of their own and are exquisite on a large scale. Guests will appreciate the uniquely designed living and work spaces that measure 120 sqm. 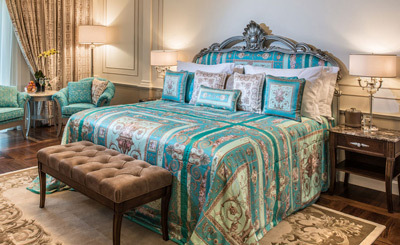 The bedroom includes a super king size bed with Versace linen and a uniquely designed dressing area with a walk-in wardrobe and Hollywood-style vanity table – a fashionistas’ dream come to life. Thoughtfully designed for the modern day luxury traveller, these suites measuring 130 sqm combine chic interiors with touches of fine workmanship. On entering, guests are welcomed with a spacious living room that includes a dining area. This is separated from the bedroom, ensuring absolute privacy. 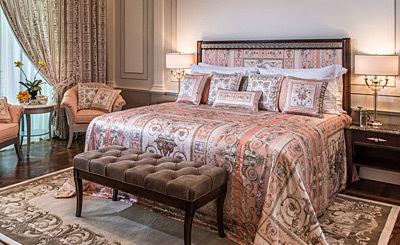 The bedroom includes a super king size bed with Versace linen and a uniquely designed dressing area with a walk-in wardrobe and Hollywood-style vanity table – a fashionistas’ dream come to life. These suites enjoy plenty of sunlight, with a choice between balconies, terraces and floor-to-ceiling windows overlooking views of either the Dubai Creek or Culture Village. 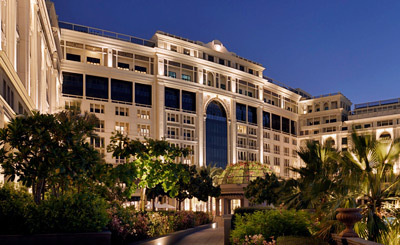 Guests can also enjoy unparalleled service with access to the Executive Lounge and its benefits throughout their stay. 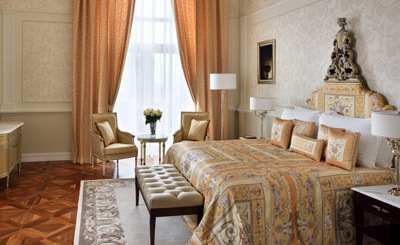 Measuring 214 sqm these classic Palazzo Versace suites are a masterwork of décor and space. Impeccably furnished, with large windows that allow plenty of light and encompass stunning views of the Dubai skyline, the living room is the perfect retreat for families or executive meetings. Guests can relax on the king size bed or catch up on work at the comfortable wood-panelled work desk in the bedroom. Those who admire the finer things will appreciate the intricate detailing and workmanship applied to each element of these suites. 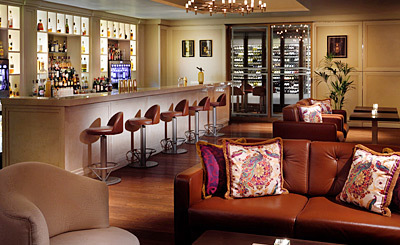 Guests can also enjoy unparalleled service with access to the Executive Lounge and its benefits throughout their stay.